, professor of the law of nature and nations, and of history, at Francfort on the Oder, and a member of the royal society of Berlin, was born March 13, 1677, at Rottenburgh, in Hesse. His father was rector of that place, and became afterwards minister and dean. His son was at first educated under his care, which he amply repaid by a proficiency far beyond his years. 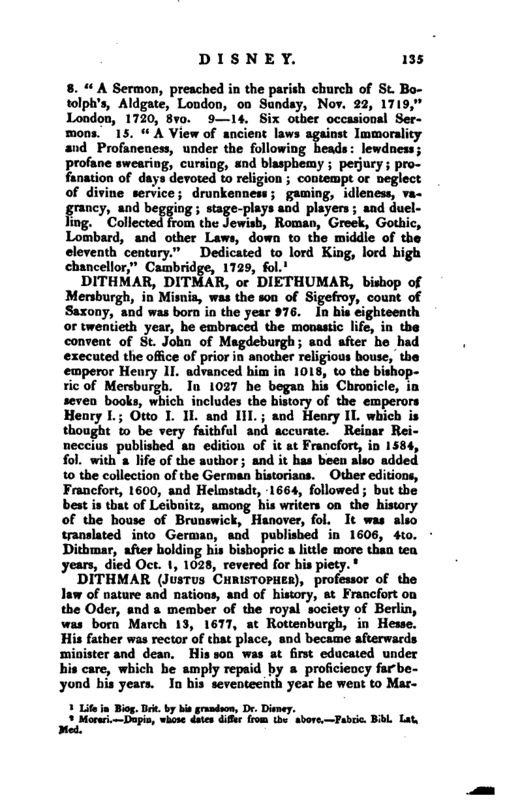 In his seventeenth year he went to | Marpurg, and studied under Otto, the celebrated orientalist, and Tilemann, professor of divinity, with whom he lodged, and who afterwards procured him the appointment of tutor to the two young barons of Morrien. Dithmar executed this office with general satisfaction, and when he went afterwards to prosecute his studies at Leyden, he was maintained at the expence of the landgrave of He^r Cusstl. He afterwards travelled over some parts of Germany and Holland, as tutor to the son of M. the great president Dancklemann. 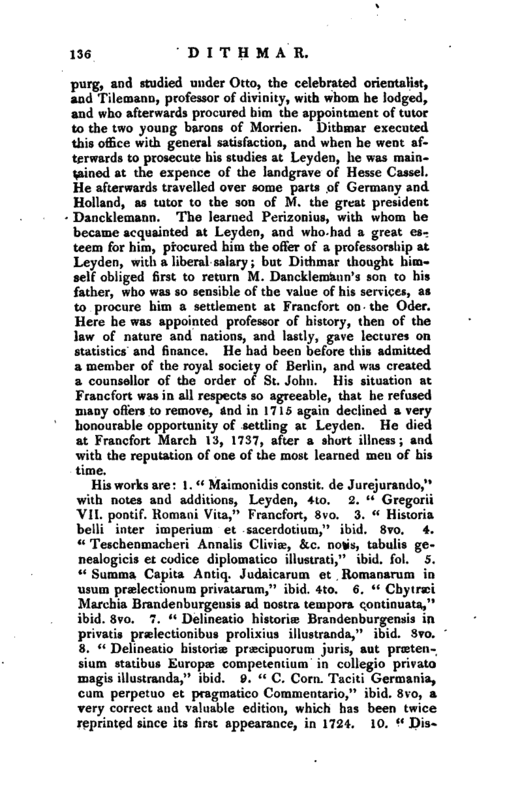 The learned Perizonius, with whom he became acquainted at Leyden, and who had a great esteem for him, procured him the offer of a professorship at Leyden, with a liberal salary but Dithmar thought himself obliged first to return M. Dancklemann’s sun to his father, who was so sensible of the value of his services, as to procure him a settlement at Francfort on the Oder. 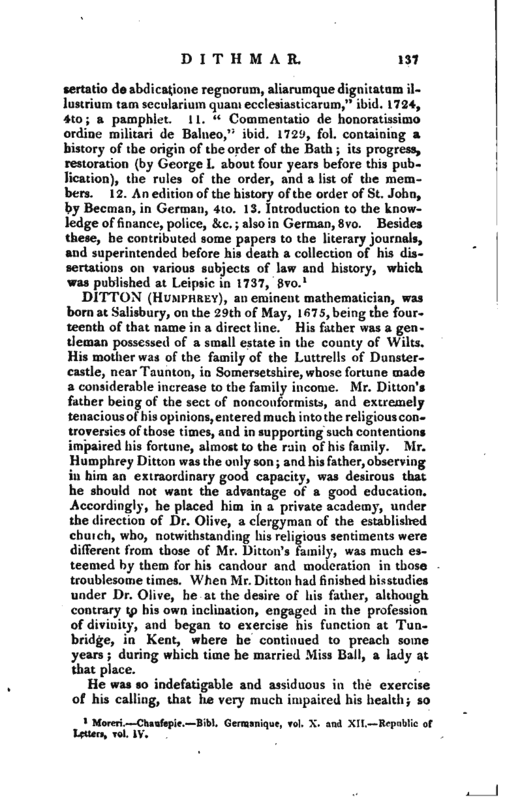 Here he was appointed professor of history, then of the law of nature and nations, and lastly, gave lectures on statistics and finance. He had been before this admitted a member of the royal society of Berlin, and was created a counsellor of the order of St. John. His situation at Francfort was in all respects so agreeable, that he refused many offers to remove, and in 1715 again declined a very honourable opportunity of settling at Leyden. He died at Francfort March 13, 1737, after a short illness; and with the reputation of one of the most learned men of his time. 1 Moreri. —Chaufepie. Bibl. Gerraanique, vol. X. and XII. Republic of Letters, vol. IV.